Note there is no longer a "hatched" border. If you see a label with the "hatched" border - it is likely the information on it may not be current. CHECK IT OUT FURTHER AND ASK YOUR SUPERVISOR! Assign responsibility for program implementation. 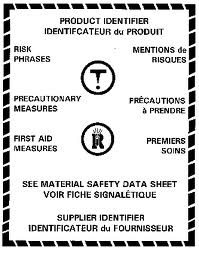 Set up an inventory to determine all hazardous products in the workplace. Ensure all labelling and SDS requirements are fulfilled. Review and upgrade your program when required. 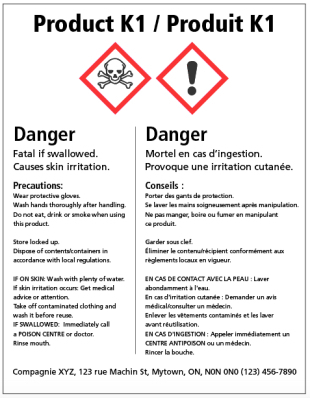 REMEMBER There are two parts to the WHMIS program. 2. On the work-site training - IMPLEMENTATION Training which your boss, supervisor or designated person, MUST deliver to you prior to working on the job. what "controlled" products might you be working with? where is the safety equipment kept? what are the company emergency procedures? where is the SDS information kept in your workplace?